—"This is my little man Elliott Albert Pants. We just call him Mr. Pants. 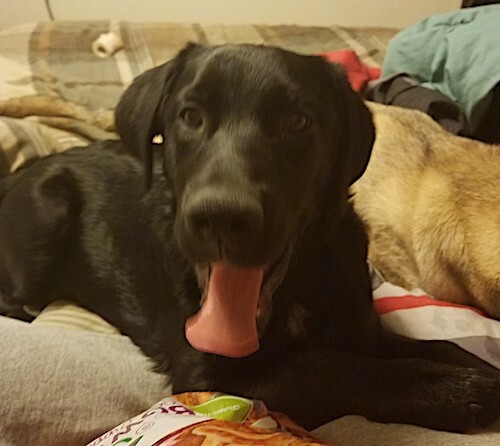 He is an Australian Shepherd / black Lab mix. We brought him home when he was 8 weeks old to become my service dog. He is now 5 months old weighing in at 45lbs. So far he has shown an amazing ability to sense my needs, he learns very fast. He has the goofiness of the Lab and the herding from the Aussie. The thing most interesting is how much he learns by observation. We have 3 other dogs and Mr. Pants will sit and watch, then emulate their behaviors. I couldn't have asked for a better pup." The Aussiedor is not a purebred dog. It is a cross between the Australian Shepherd and the Labrador Retriever.The best way to determine the temperament of a mixed breed is to look up allbreeds in the cross and know you can get any combination of any of thecharacteristics found in either breed. Not all of these designer hybrid dogs being bred are 50% purebred to 50% purebred. It is very common for breeders to breed multi-generation crosses.